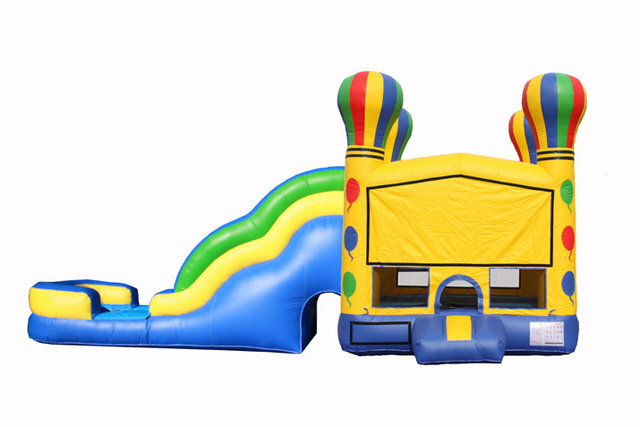 Mega big Hot Air Themed Combo Bounce and Slide gives you the best of both worlds. Has a bouncehouse inside, with a basketball hoop and mini obstacle poles, and to top off the fun, a 10 foot tall slide!! Great for any party Comes with a bumper when used, so wet kids won't slide out! Come with Waterslide Attachments when ordered wet Also referred to as a 5in1 combo. Measures 16 x 35. Guraranteed to be a big hit at your event!